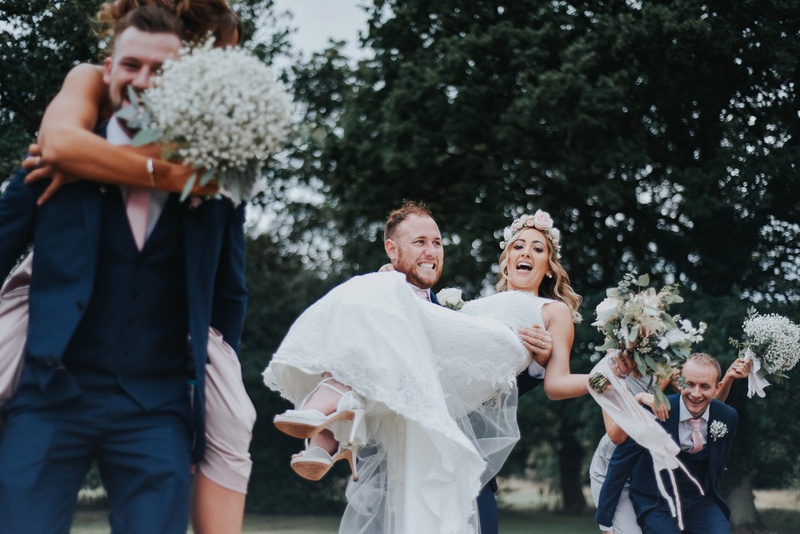 We’re not sure we could be anymore in love with Sophie and Sam’s Cheshire wedding that we’re sharing with you today. A dreamy rustic affair, their big day features the lushest of details to complement their gorgeous choice of venue, with big blousy blooms and trailing foliage running from the bouquets and flower crowns through to natural centrepieces and beautiful milk churn arrangements – we’re in floral heaven! Further crushes for us come in the form of their macramé backdrop, Pinterest-worthy cake and soft, whimsical colour palette. 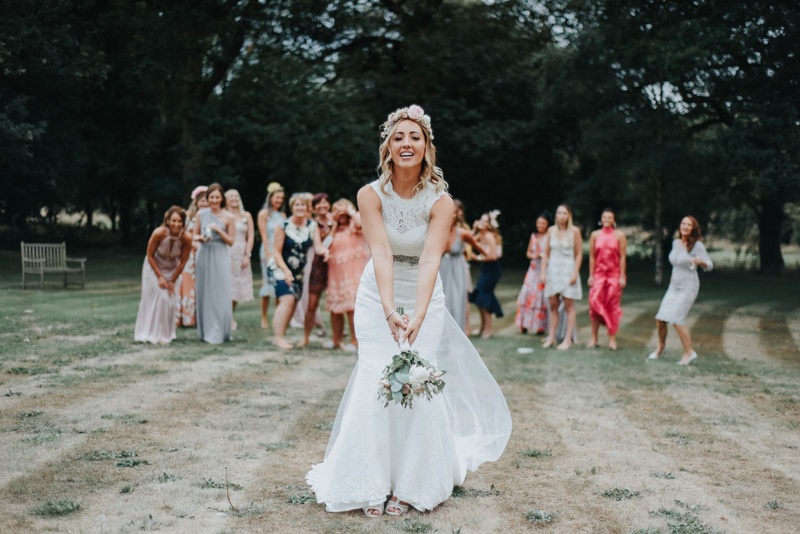 But what we find most inspiring is their decision to take the evening party outdoors and under the cover of a cool tipi, complete with dancefloor, firepits, chillout area and glitter bar. I mean, talk about #weddinggoals! With images by Bobtale Photography. Sam & Sophie: Weddings at The Oak Tree Peover (4K) from RT Productions LTD on Vimeo. Sophie says: On 29th May 2016, Sam and I went up to Lake Windermere for a weekend away over the Bank Holiday. During the day we went to Go Ape before heading over to my auntie’s cottage in Bowness. Around 7pm there was a knock at the door, Sam asked me to go answer the door…only to find my chocolate Labrador, Jenson, dressed in a top hat and dickie bow with a bone around his neck saying: “mummy will you marry daddy?”. With my sister trying to hide behind a plant pot and her boyfriend hiding behind a wall filming the entire thing, Sam eventually made his way out the bathroom, got down on one knee and put the ring on my finger. Our wedding date was 18th August 2018. We got married at The Oak Tree of Peover, in Knutsford. We had everything at the venue but instead of just using the venue on its own, we had tipis supplied by Tipi Unique for our evening reception for the dancefloor, band, fire pit and chill out area to add something a little different to our day. When we first saw The Oak Tree, it was just our type of wedding venue. It was absolutely perfect for the two of us and ticked all the boxes. It was rustic, exclusive, in the countryside, quaint, beautiful, simple but yet really effective and classy. It thought it was a real hidden gem. The added bonus to The Oak Tree was that they would allow the tipis, which was exactly what we wanted as we fell completely in love with the tipis when we very first saw them. 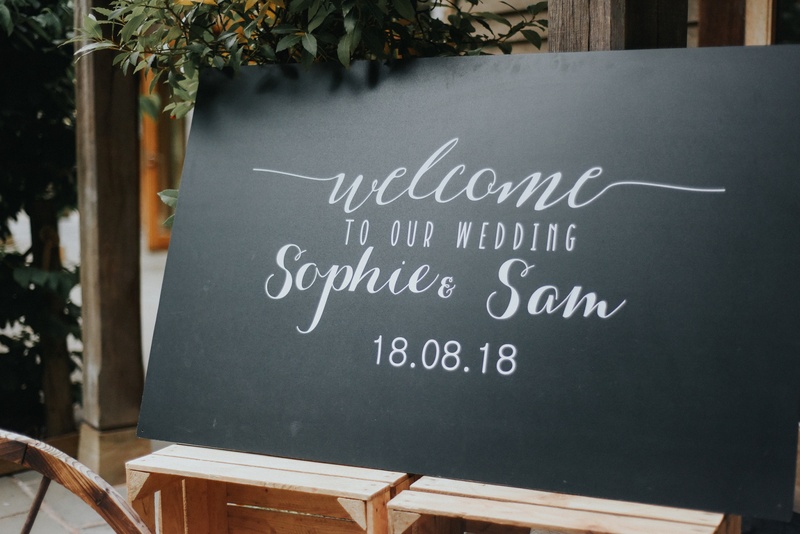 We always knew we wanted a very rustic, bohemian, romantic and laid-back wedding – because it’s exactly who we are. We added in some little extras of things we love as a couple, e.g. little bits of Harry Potter, and of our gorgeous Jenson had the be there in cardboard cut-out form. 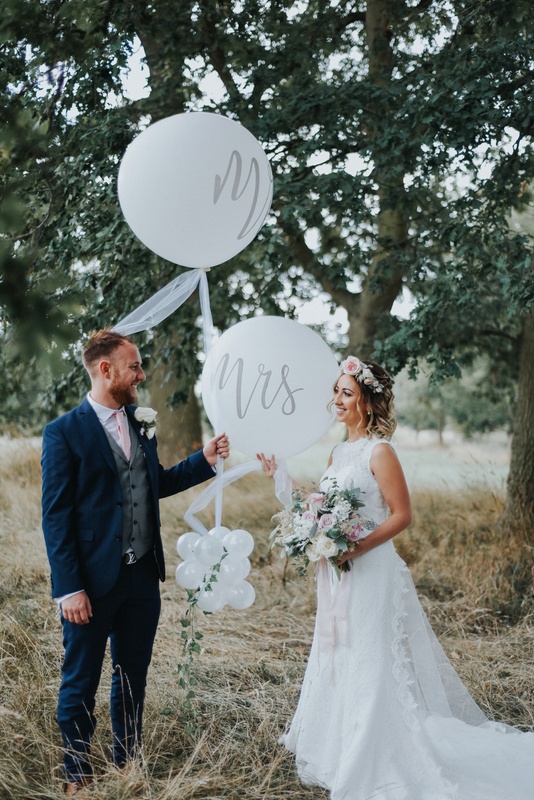 Our wedding colour scheme was plenty of soft pinks, whites and soft greys, we chose these colours as we thought they went amazing together and were very rustic and simple. The colours were really effective without being too overpowering. When I went dress as shopping, myself, mum and nan just thought we would travel out to The Bridal Factory Outlet in Stockport, just to try on a few different types of dresses to get a feel for what I wanted, but it was there I found my dress. I went for a simple high neck, slightly fishtail, with no sleeves, full lace with buttons all the way down from my neck to bottom of my back, On the dress, we added a vintage style belt and changed a veil into a detachable added train to give that little extra detail at the back. I chose this dress because it felt amazing on and suited me to a tee. It fitted perfectly and really complemented my figure and personality. My shoes were by Charlotte Mills. Sam wore a blue suit which we bought from Next, with a grey waistcoat and pale pink tie, both to tie in with the colour of the bridesmaid dresses. His shoes were from ASOS and belt from Louis Vuitton. The best men and ushers wore suits also from Next, all of which had blue waistcoats instead of grey. The bridesmaids’ dresses were multiway designs by Debut at Debenhams. Three of my bridesmaids wore a dusky pink and the other three wore a light grey. My two flower girls wore little white tutu dresses in, which we found online. Our photographer on the day was Bobtale Photography. 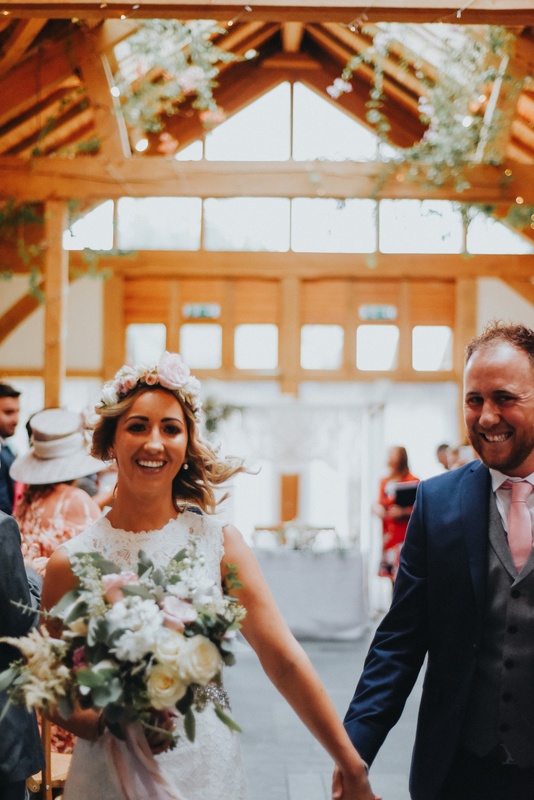 Robyn was amazing, she was very professional and kept us as ease during the run up and on the wedding day, nothing was too much trouble for her. Robyn was full of different ideas and captured our day perfectly. We would highly recommend Robyn to any bride and groom – she’s sensational! Roland and Lisa from RTP Wedding Films did an amazing job of filming and capturing our day. We would recommend them all day long. They made us feel completely at ease, they blended in with all the guests and captured out day beautifully. My bouquet was supplied my Wild Flowers in Standish, Wigan. In my bouquet, florist Kerry included white and light pink roses, peonies, stocks, wax flower, eucalyptus and scenecio. My bridesmaids’ bouquets were simple yet effective gypsophila. Kerry at Wild Flowers provided the flowers for our wedding reception too, but they were styled by Emma at Love and Lace, Standish. Kerry filled the birdcages for us, which we supplied to use for some centrepieces, and we provided Emma with plenty jam jars, hurricane vases, lanterns, tea light holders, blossom trees, bark candle holders and log slices to decorate our reception. 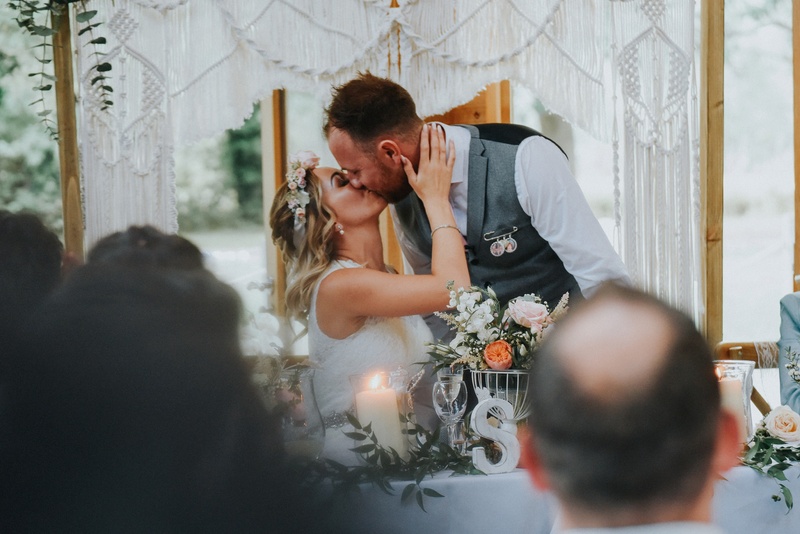 We hired a macramé backdrop from Little White Attic which we loved, super beautiful and something no one had seen before. It was amazing for our ceremony backdrop, behind our top table and for photos, we can’t recommend Lucy enough. The backdrop was utterly stunning and fitted our wedding and venue perfectly. For wedding favours, each guest received a Kilner glass with a small jar of “mint to be” mints, and either a Harry Potter themed chocolate frog or a Ferrero Rocher golden snitch. Our cake was a four-tier half-naked and half semi-naked cake consisting of chocolate, vanilla, lemon and fruit cake. Mrs Lyons Tea Rooms supplied our wedding cake and they also supplied our croquembouche, which was fantastic. For our wedding breakfast we chose a sundried tomato bruschetta and a feta cheese filo to start, roast chicken and roast beef for mains and a trio of desserts consisting of Eton mess, lemon tart and profiteroles. We chose all of the wedding breakfast simply because each choice was either mine or Sam’s favourite meals. The wedding breakfast was supplied by Sue Le-Bonne. In the evening, we decided to have crepes, which again is a favourite food of ours, and it was something we hadn’t seen before at a wedding. These were supplied by Original Crepes. During the day we had an acoustic singer, Tom Rowe to sing during the wedding breakfast. We chose Tom because we just loved the sound and tone of this voice and he sung the type of music we love as a couple. Every guest commented on how amazing he was. In the evening, Tom was joined by the band he is part of, The Db’s. We hadn’t actually heard the band ourselves, but they were recommended to us by Roland (our videographer) and we were so glad we went with them. They were brilliant, and people were on the dancefloor all night. During the day we had a selection of garden games for people to enjoy in the sunshine. During the evening, we hired a photobooth from Photohaus and we also had Sophie from Wish Upon a Sparkle to come and glitter guests beards, heads, faces and arms as I love a bit of glitter and sparkle. 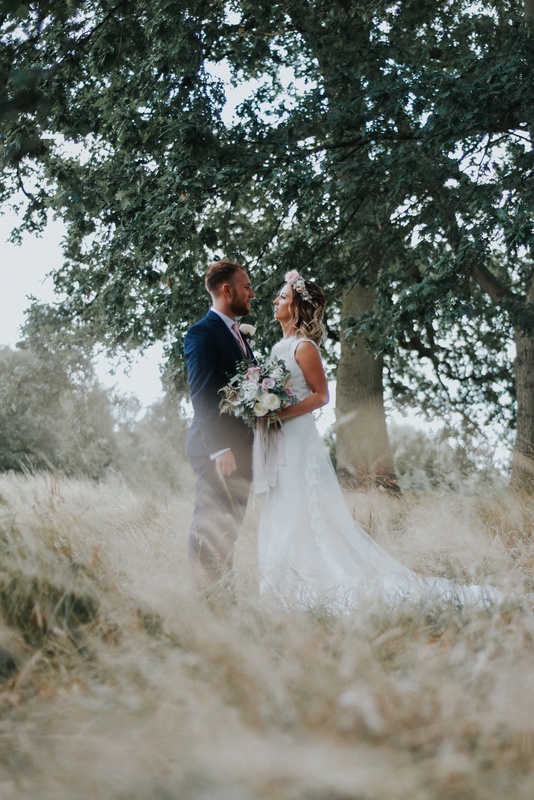 We would without a doubt recommend The Oak Tree of Peover to other couples because it’s simply beautiful, the staff were amazing all day, everything was immaculate and done perfectly. They were really helpful, and nothing was too much trouble on the day. It’s a hidden gem that really does shine very bright. My favourite part of the day was the bit I was at first terrified of…walking into a room full of people looking directly at me and my dad, but it was the best and most surreal feeling in the world. Seeing all of the ones that matter the most come together to see you marry each other was unbelievable and to see Sam stood at the very top, not taking his eyes off me, was the most amazing thing I’ve ever seen. A few days after the wedding we did a short minimoon to Barcelona and it was just what we needed, a little quick break to take in all of the magic of our wedding day and unwind in the sunshine with a few cocktails and plenty of sightseeing. For our main honeymoon, we will be travelling around the west coast of California, starting in Las Vegas, then to San Francisco, driving the Big Sur and onto San Diego and L.A. We can’t wait! My top tip to other Brides Up North is to book your favourite suppliers as soon as you can to avoid disappointment. Take it all in, from the engagement straight through to the wedding day (everyone says it, but it really does go fast). Enjoy your day and try not to worry about anyone else bar yourself and your husband, the day is your day and it really is such a magical experience. I used Brides Up North whilst planning our wedding quite a lot. We went to a couple of Brides Up North wedding fairs, which I found very useful for ideas, top tips and plenty of inspiration. I also was hooked on reading the real weddings section of the website and followed all the posts on Instagram etc. for loads of ideas and inspiration. I found it all super helpful whilst planning our big day.